I know that White History Month has passed, and I wanted to get this one as a Friday Five, but I wasn't able to (please, no CP Time jokes). Most white folks abhor the racist stereotypes and plot of D.W. Griffith’s “masterpiece.” What makes this a White movie isn’t the racism, it’s the selective detachment of its fans: the ability to set aside their disdain for the film’s reprehensible content while appreciating its stylistic appeal and praising Griffith’s technical prowess. It’s not even a matter of the aggrieved being black. Leni Riefenstahl, though frequently condemned a “Nazi hag,” receives similar praise for her Nazi propaganda film Triumph of the Will. Remember that the next time an old white critic is talking about the moral and stylistic bankruptcy of all rap music. The softer side of Birth of a Nation. Confederate apologist melodrama. Filled with rank stereotypes about happy darkies. What more could you want? The ultimate white male fantasy. Its moral is that white people’s hard work and grit can allow them to triumph over physically gifted, but undisciplined, flashy, loudmouthed black people. This is still played out in every major sport today. Peep the dominant narrative of the recent Floyd Mayweather/Ricky Hatton fight. Hoosiers also fits into this category. This one isn’t as obvious as Rocky. 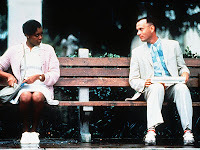 Forrest Gump, as some scholars have argued, struck a chord with so many, because its vision of History is America’s dominant vision of History. Forrest lumbers blindy through the past (his present), not as an agent, but as a passive screen upon which History plays out. “Segregation? Vietnam? Who me? I had no part in that.” And, to prove that he wasn’t racist, Forrest's best friend was a dim-witted black Bama, who predictably died in Forrest’s arms (side note: Dave Chappelle, who worked with Hanks in You’ve Got Mail, turned down the role of Bubba because it was offensive and stereotypical). Contains two of White people’s favorite things: 1950s nostalgia (no black people) and jazz hands. EVERY month is white history month! We invented writing and almost everything else in the world, and then shared it all. Great movies! Glad you like them.